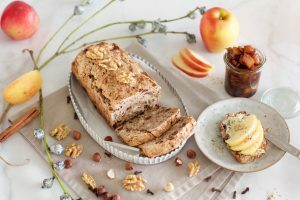 We are still in the midst of the apple season and apples are our home superfood number 1, so I don’t want to miss sharing this delicious recipe for apple fruit bread with you. As already mentioned, you can eat the bread both hearty and sweet. That’s why at the end of the blog post I have the matching apple chutney as a recommendation for you. Apples are real all-rounders and incredibly versatile to use in the kitchen. They are delicious and at the same time make an important contribution to a balanced, healthy diet. Did you know that apples with around 30 vitamins and minerals are among the healthiest fruits ever? And that despite the fact that they are low in calories. A medium-sized apple, for example, contains only about 60 calories and 85 % of water. Apples strengthen our immune system because they contain important trace elements, vitamins and minerals. And their high pectin content has a positive effect on our intestinal health. “An apple a day” is therefore not just a saying, but a fact. Apples are definitely one of the most valuable foods for all those who want to stay healthy, fit and slim. 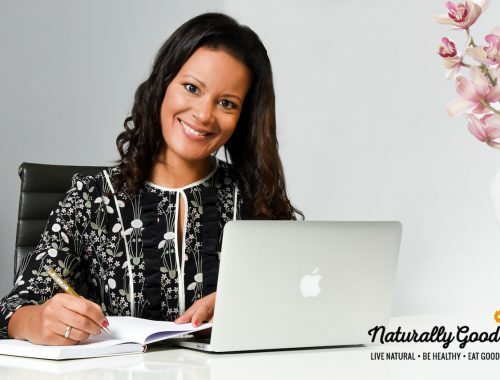 It makes even more sense to include them in your diet every day, because if you eat them regularly, they should even have a positive effect on your heart health. But back to the apple bread recipe you really need to try. In the sweet kitchen apples harmonize with almost everything. In cakes, pies, as puree, or as here, in fruit bread processed… Apples make a good impression everywhere. 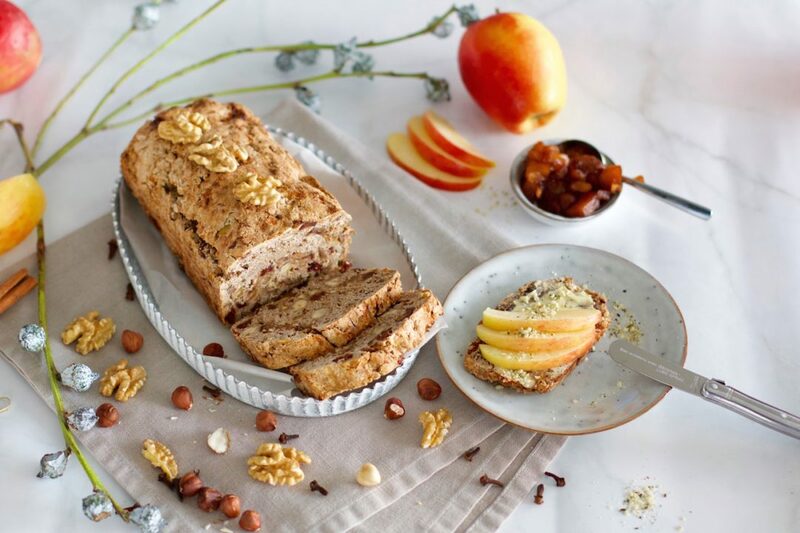 That’s why the main ingredients for apple bread – how else could it be – are apples. However, I did not choose any kind of apple, but deliberately chose the delicious JAZZ™ apples. JAZZ™ apples staste distinctively crunchy, sweet and juicy. The natural combination of Royal Gala and Braeburn is cultivated in sun-blessed regions and combines the best of both apple varieties. I think they are the best apple variety for the recipe. JAZZ™ apples are currently available from other European cultivation areas, i.e. from Germany, South Tyrol and France, and can be found in specialized food shops, fruit shops and weekly markets. 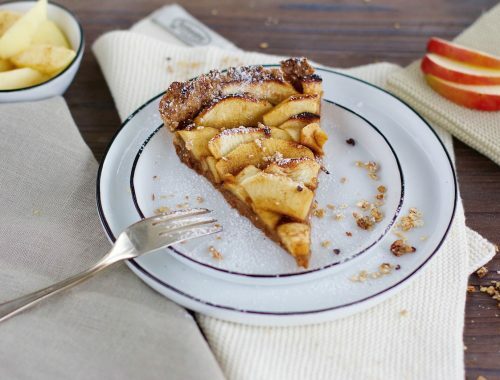 Dried fruit, nuts and tasty spices such as cinnamon and cloves are added to the fresh apple pieces. This creates an irresistible heavenly smelling that spreads throughout the kitchen. 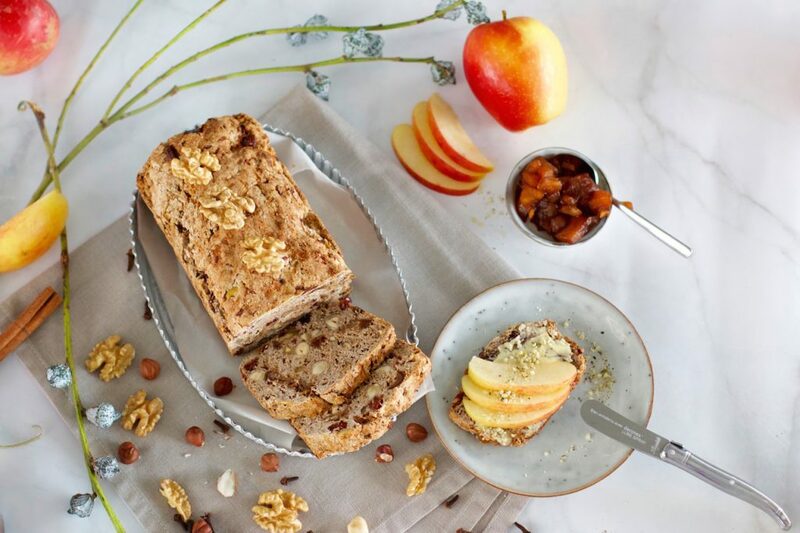 In general, I think a healthy apple fruit bread is a perfect match for the upcoming Advent and Christmas season. The bread has really become incredibly juicy and tasty. It tastes sweet as well as hearty, for example with a sweetish spicy apple chutney. Would you like to try it? Both recipes are made super fast. 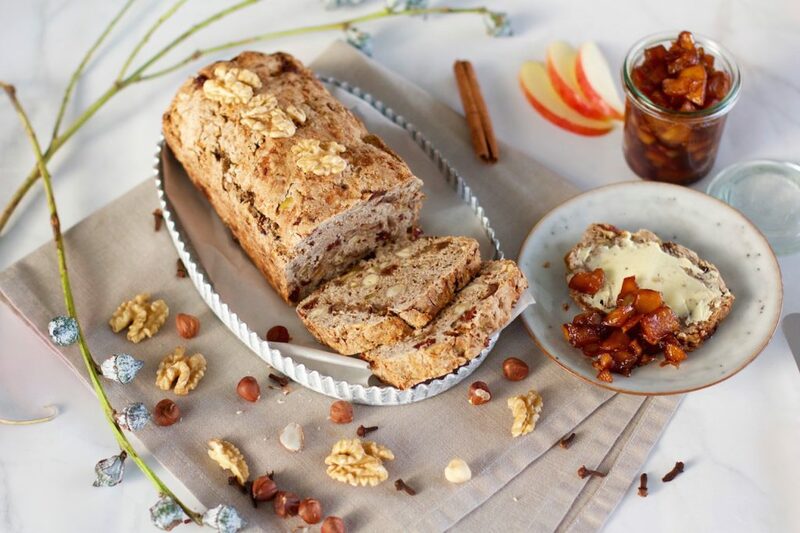 Both a sweet and a hearty spread go well with apple bread. 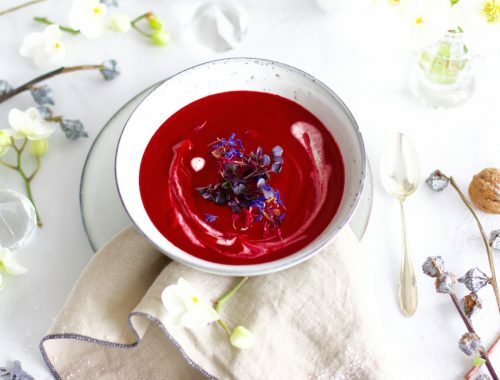 The recipe is vegan, lactose-free and yeast-free. Peel and roughly grate the apples. Mix apples with dried fruits, nuts and maple syrup. Add the remaining ingredients and knead into a homogeneous dough. The dough should be well moistened. If it seems too dry, add some maple syrup or water. Form the dough into a loaf of bread and bake at 180 degrees for approx. 75 minutes. Peel, seed and chop the apples. Peel onion and ginger and chop finely. Cut the chilli pepper into thin strips. Heat a pot with apple vinegar and add coconut blossom sugar. As soon as the sugar has dissolved, add the apples and chilli strips. Cook the apple chutney at moderate heat for about 30-45 minutes. Finally season with salt and optionally some coconut blossom sugar. Immediately fill into preserving jars and turn them upside down so that a vacuum is created. The chutney can be kept in the fridge for several weeks.